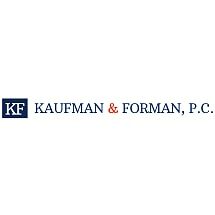 At Kaufman & Forman, P.C., our attorneys provide a broad range of legal services to business and individual clients throughout Georgia, nationwide and around the world. For more than 30 years, we have dedicated our practice to providing the resources and representation of a large firm with the attention to personalized service of a boutique practice. Whether handling complex business litigation matters or corporate work or addressing complex intellectual property issues, we bring an intelligent and experienced approach to resolving the most sophisticated legal issues in a cost-effective and personalized manner. More than just a team of lawyers, we are problem solvers. We help our clients find efficient, cost-effective solutions to their legal issues while providing the guidance and counsel to help them prepare for the future. Our attorneys have been recognized by former clients and peers in the legal community with an AV Preeminent* rating through Martindale-Hubbell. To discuss your options and learn more about our services, contact our Atlanta, Georgia, law office. Kaufman, Miller & Sivertsen, P.C.